Plastic Omnium, which is known for its front-end modules and other exterior components, has seen growing demand for its SCR diesel after-treatment technology as automakers race to meet tougher emissions standards. Plastic Omnium, a leading maker of systems that clean up emissions from diesel, is preparing for a future of sharply reduced demand for the powertrain, the company’s co-CEO, Jean-Michel Szczerba, says. Last year, the French supplier reported 390 million euros in sales for its selective catalytic reduction (SCR) technology, with six customers and a total of 19 programs. It was part of a successful year for Plastic Omnium, with sales up 15 percent to 8 billion euros, and operating margin reaching 9.5 percent. SCR is more expensive than lean nitrogen oxide traps (LNTs) but is considered more effective at reducing harmful NOx emissions from diesels, especially when the car is on the road. That is important because European Union emissions homologation is now partly calculated by the Real Driving Emissions (RDE) test. PSA Group and Daimler have been early adopters of SCR, and a report last autumn from consulting group Bernstein found that "SCR technology looks almost essential to meet Euro 6c" emissions standards, which start to take effect in September. Volkswagen Group, Europe's biggest automaker, is moving toward SCR, and other automakers are likely to follow suit, Bernstein said. That bodes well in the short-term for Plastic Omnium, Szczerba said. The supplier won contracts with five new SCR customers and a total of eight new programs in 2017. However, the company is closely watching the decline of diesel sales, which fell by 7.9 percent to 6.77 million units in Europe last year, resulting in a share of 43.8 percent of total registrations. That share is 11.1 percentage points lower than diesel's peak that was reached in 2011. Sales of the powertrain have been hit by consumer worries about local bans of older, more polluting diesels, fallout from the Volkswagen Group's emissions-cheating scandal and the increasing cost of after treatment systems to bring diesels into compliance with stricter pollution rules. "Today we are generating 390 million euros in annual sales with SCR; we have orders that will reach 600 million euros in four or five years, but then we think it will decline," Szczerba told Automotive News Europe. Plastic Omnium plans to make up that revenue by producing fuel systems for hybrids and becoming a leader in hydrogen fuel cell powertrains -- a technology that Szczerba admitted is not yet ready for widespread adoption. "The fuel cell business is for after 2030," he said. "We are in 2018. I think it's clear that the main development in the next 10 years will be hybrid electric vehicles. Our main short-term and midterm target is to provide automakers with fuel tanks for hybrid-electric vehicles and plug-in hybrids." Plastic Omnium is developing its hydrogen fuel cell expertise through strategic acquisitions and joint ventures. Last year it bought Optimum CPV, a Belgian company that makes high-pressure hydrogen storage vessels, and Swiss Hydrogen, which works in fluid and thermal management. In 2016, it set up a joint venture in Israel with Elbit Systems called POCellTech. The company works on fuel cells and supercapacitors. "Our target with fuel cells is to become a competitor to internal combustion engines," Szczerba said. "We want to develop a fuel cell powertrain at the same price as an internal combustion one, so about 4,000 euros, with the same range, about 800 km, and with the same refueling time, about 3 minutes." Plastic Omnium is taking other steps to prepare for its future. Last year it bought back 53.6 million worth of shares to help strengthen family control. About 60 percent of Plastic Omnium is now owned by the Burelle family holding company. Plastic Omnium was started in 1946 by Pierre Burelle, and his son Laurent has been chairman and CEO since 2001. 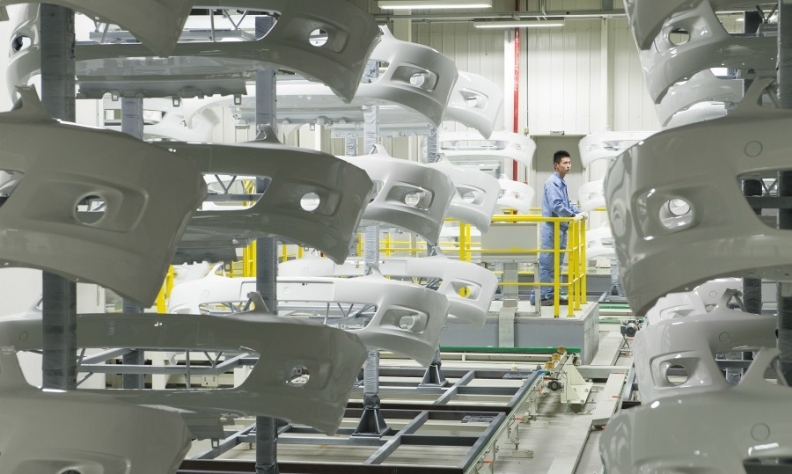 Plastic Omnium ranks 29th in Automotive News Europe’s list of the top 100 global suppliers, with sales with automakers of $8 billion. Like many other prominent suppliers, Plastic Omnium is seeking to divest from non-core businesses and strengthen itself in key areas so it can provide solutions for autonomous and electrically driven vehicles. In 2016, the company purchased Faurecia's exteriors business, which had an enterprise value of 402 million euros, a move that gave it access to premium German automakers. "We wanted to create a relationship for bumpers with Daimler, with Audi and with Ford, which were our customers for fuel systems," Szczerba said. "Last year we got an order for the bumpers for the Mercedes S class. It was proof that we were able to be at an excellent level for our top customers." In January, Plastic Omnium bought out Mahle's share in HBPO, a three-way joint venture that makes front-end modules, for 350 million euros. Many of the sensors essential for autonomous driving will be molded into the front ends, and Szczerba said Plastic Omnium's goal is to be the world leader in such "smart bodies." We want to integrate and to protect all the sensors and radars which will be integrated in the car of tomorrow. To do that, we need the expertise in modularity that HBPO can give us," he said. Plastic Omnium has also acquired a stake in Tactotek, a Finnish startup that develops injection-molded structural electronics.